Faculty members of the Department of Urology have been pioneers in developing new innovations and technologies leading to safer and more effective treatments for patients. Some of our discoveries have revolutionized the diagnosis and treatment of urologic conditions, while others have improved upon breakthroughs made at other research facilities or academic medical centers. Developments from our landmark studies on outcomes and quality of life for prostate cancer patients have become standards throughout the world. Still other innovations have re-engineered diagnostics or streamlined patient information systems, enabling physicians to devote more time to patient care. Listed below is a sampling of the innovations and technological breakthroughs that UCLA Department of Urology faculty members have developed. The UCLA Department of Urology’s Division of Endourology and Minimally Invasive Surgery is collaborating with other specialists within the David Geffen School of Medicine at UCLA to develop new technologies for more effective treatments for our patients. Among these advances have been new approaches and techniques in minimally invasive surgery, using miniature instruments inserted via a small tube (called a laparoscope) through tiny incisions in the body. Laparoscopic surgery has revolutionized the way patients are treated for a variety of conditions because these minimally invasive procedures result in less discomfort, quicker recovery times and better outcomes for patients than traditional “open” surgery.Specifically, faculty members of the UCLA Department of Urology are collaborating with the UCLA Biomechanical Engineering Department to develop novel biological sensors, instruments, and surgical techniques for use in minimally invasive surgery. Urologic conditions for which UCLA currently offers minimally invasive surgery include kidney stones, live donor nephrectomy, pelvic organ prolapse, prostate cancer, renal cell carcinoma, renal cysts, transitional cell carcinoma, uretal stricture, and uretopelvic junction obstruction. While minimally invasive surgery has been used successfully in adults, faculty members at UCLA have successfully refined the use of laparoscopic surgery in children, as well. Some of these procedures include nephrectomy, which removes malformed or dysfunctional kidneys; pyleloplasty, which removes blockages in the ureter; and treatment of undescended testicles in infants. The UCLA Prostate Cancer Index, developed by Mark Litwin, M.D., M.P.H., has become the gold standard worldwide in measuring outcomes and quality of life in prostate cancer survivors. The UCLA Prostate Cancer Index is now in use in over 200 studies throughout North America and has been translated into Spanish, Dutch, and Japanese for cross-cultural use. Dr. Litwin 's research includes medical outcomes assessment, health-related quality of life, urologic oncology, cost-efficacy and resource utilization in urological care, and patient preferences. He published the first validated instrument to assess disease-targeted health-related quality of life in men treated for prostate cancer and has been an international leader in this area. His research is funded by the National Institute of Diabetes, Digestive and Kidney Diseases, American Cancer Society, California Department of Health Services, and other organizations. A Bioengineering Research Partnership Project Sponsored by the National Institutes of Health-National Institute of Biomedical Imaging and Bioengineering (NiH-NIBIB), the uropathenogen detection project at UCLA aims to develop and test a rapid new system that would enable point-of-care diagnosis and treatment of urinary tract infections using clinical urine samples. Although cryosurgery has been used since the 1960s, unique applications are being developed to make it a desirable treatment option for some patients. New cryosurgical technology for prostate cancer treatment allows the surgeon to precisely map cancerous cells, freezing and killing the cells that radical prostatectomy would not reach. Offered as an option for most patients who would be candidates for an open radical prostatectomy. Laparoscopic prostatectomy allows the removal of the prostate through an umbilical incision. Patients usually leave the hospital the next day, and the need for pain medication seems to be reduced. The procedure is as effective as open radical prostatectomy in removing the cancer. Until recently, nephrectomy, or removal of a kidney, was a major operation requiring open surgery and up to eight weeks of recovery. The extent of the procedure was often a deterrent for healthy donors to agree to donate a kidney. But laparoscopic nephrectomy is much less invasive, meaning less pain, a shorter recovery period, and a rapid return to normal activity. 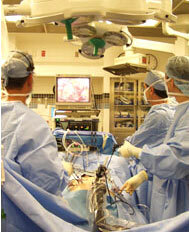 Doctors use a miniature video camera and other instruments to perform the procedure. Roughly half of all prostate cancer patients decline radical surgery, which involves the removal of the prostate. For many of these patients, cryosurgery—which uses freezing as a means of destroying diseased tissues-- can be effective and is equivalent to radiation therapy in eradicating the cancer. The newest cryosurgical technique injects the prostate with ultra-thin cryoprobes cooled by argon gas. This allows the surgeon to map the placement of ice balls and control temperatures throughout the procedure. The procedure can be done on an outpatient basis and can be performed without an incision, resulting in minimal side effects or blood loss. This procedure is being tested on kidney cancer patients, with encouraging results. Faculty members in the Department of Urology are also working with private industry to train other surgeons in minimally invasive surgery. In collaboration with these industry partners, the Departments of Urology and Surgery at UCLA established the Center for Advanced Surgical and Interventional Technology (CASIT), which allows surgeons at remote locations to be trained via teleconferencing and telesurgery.